Are you looking for engaging notes and activities with quality content for 8th Grade CCSS Number Systems?! 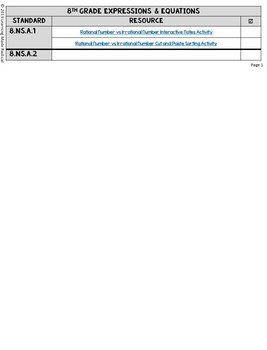 This is a great resource reference sheet that helps break down all the resources I have in my store that are linked to the 8th Grade Number Systems Common Core State Standards. 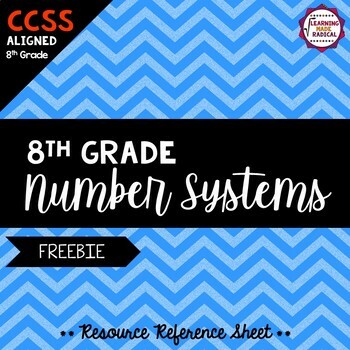 This file is ONLY a 'Resource Reference Sheet' - this allows you to preview ALL the resources that are available in the 8th Grade Number Systems section in my store. It allows you to see the alignment between the resource and the CCSS. This resource highlights the great engaging supplemental resource activities available; coloring and time filler cards! All of the resources are hyperlinked and you can click any of them to see more details about each resource. Feel free to reach out to me through Q&A or email me at kholland2007@gmail.com with any questions! I know you will be happy with the variety and content that is in each activity!